Not to be confused with Harrison Township, Michigan. 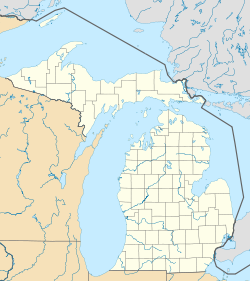 Harrison is a city in the U.S. state of Michigan. The population was 2,114 at the 2010 census. It is the county seat of Clare County. The city is named after U.S. President William Henry Harrison. Harrison was founded as a lumber town, with sawmills located on the shores of Budd Lake. One of the lumber companies donated the land which is now Wilson State Park. The City of Harrison attracts thousands of visitors from throughout the state, with its "twenty lakes in twenty minutes" and large amount of state land for recreational sports. There are several historic buildings in the city of Harrison. The Surrey House is a relic of the lumber town days. The Clare County Newspaper building, located downtown, is the oldest building in Harrison, dating back to 1898. Owners Rauch and Bucholz family gives tours of the Cleaver building, in addition to a walking tour of downtown Harrison. As of the census of 2010, there were 2,114 people, 913 households, and 524 families residing in the city. The population density was 568.3 inhabitants per square mile (219.4/km2). There were 1,306 housing units at an average density of 351.1 per square mile (135.6/km2). The racial makeup of the city was 93.7% White, 1.7% African American, 0.8% Native American, 0.5% Asian, 0.2% from other races, and 3.1% from two or more races. Hispanic or Latino of any race were 2.5% of the population. There were 913 households of which 26.9% had children under the age of 18 living with them, 37.0% were married couples living together, 15.9% had a female householder with no husband present, 4.5% had a male householder with no wife present, and 42.6% were non-families. 37.2% of all households were made up of individuals and 17.5% had someone living alone who was 65 years of age or older. The average household size was 2.18 and the average family size was 2.79. The median age in the city was 42.1 years. 21% of residents were under the age of 18; 10.8% were between the ages of 18 and 24; 22.4% were from 25 to 44; 27.4% were from 45 to 64; and 18.4% were 65 years of age or older. The gender makeup of the city was 49.1% male and 50.9% female. As of the census of 2000, there were 2,108 people, 857 households, and 526 families residing in the city. The population density was 563.3 per square mile (217.6/km²). There were 1,187 housing units at an average density of 317.2 per square mile (122.5/km²). The racial makeup of the city was 94.78% White, 2.04% African American, 0.62% Native American, 0.71% Asian, 0.43% from other races, and 1.42% from two or more races. Hispanic or Latino of any race were 1.47% of the population. There were 857 households out of which 26.6% had children under the age of 18 living with them, 46.0% were married couples living together, 12.5% had a female householder with no husband present, and 38.6% were non-families. 35.2% of all households were made up of individuals and 18.2% had someone living alone who was 65 years of age or older. The average household size was 2.24 and the average family size was 2.83. In the city, the population was spread out with 22.3% under the age of 18, 9.7% from 18 to 24, 25.6% from 25 to 44, 24.7% from 45 to 64, and 17.7% who were 65 years of age or older. The median age was 39 years. For every 100 females, there were 93.6 males. For every 100 females age 18 and over, there were 92.5 males. The median income for a household in the city was $26,392, and the median income for a family was $35,179. Males had a median income of $32,500 versus $20,909 for females. The per capita income for the city was $15,443. About 14.1% of families and 18.5% of the population were below the poverty line, including 20.8% of those under age 18 and 15.1% of those age 65 or over. Bus. US 127 serves local business traffic through the city. Public bus service is provided by the Clare County Transit Corporation with four daily round-trips between Harrison and Clare, MI. ^ Kellogg, Angela, and Cody Beemer, Harrison (Charleston, SC: Arcadia Publishing, 2014). This page was last edited on 24 March 2019, at 05:19 (UTC).